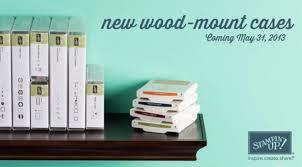 Have you heard about the new wood-mount stamp cases? They've been redesigned to be a thicker version of the clear-mount stamp cases (#119105), so now when you get new wood-mount sets, you get a case that has the stamp set name already on it as well as pictures of the stamp images. No more making a copy of your label sheet to put in the lid of your stamp box! And it also means that they are easier to store. - You can put your old wood-mount stamps into a new case for easier storage. - The half size is perfect for storing ink refills. - The full size is just right for storing Stampin' Write markers or making a case to store your adhesives like SNAIL, a box of glue dots, and Stampin' Dimensionals. - Fill one with a few of your favorite punches so that you can just grab 'n' go with your "go-to" punches. - Decorate one, line it with a napkin, and use it to carry your lunch to school or work. - Great for storing toys that have small pieces - like puzzles. And of course, these cases are fun to decorate with some Designer Series Paper and embellishments, too! So, the only question left is … what will you put in yours?